From the left, freshmen Kareem Robinson-Gipson of Menands, MacKenzie Squair of Cobleskill-Richmondville, Maeve Corcoran of Brittonkill and Mylea Braun of Schalmont present their research at SUNY Polytechnic Institute. 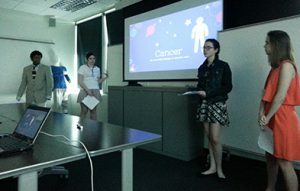 The 9th grade bioengineering class recently went to SUNY Polytechnic Institute so students could present their research and experiments on how hydrogels are used in drug delivery for cancer treatment. Each team researched a different reproductive cancer and also did an experiment to determine how the surface area of a hydrogel is related to the drug release rate. Hydrogels can be molded or injected right next to or inside the area of the body that needs the drug or medicine (like a tumor), so that the drug is targeted rather than dispersed throughout the whole body, where it is not needed or may be harmful. Dr. Nate Cady was in the audience to hear the talks, and students were treated to a tour of Dr. Cady’s lab. He is working on hydrogels as an eye protectant and a drug delivery system for eye diseases.